A Northampton man pleaded guilty to stalking after he admitted harassing an ex-partner through ‘continual abusive and insulting phone calls’ and visitations. Junior Brock, of Swale Drive, Kings Heath, appeared at Northampton Magistrates’ Court yesterday to face the charges dating between March 21 and May 4. The court heard how the 26-year-old father-of-two attended his former partner’s home in Eastern Avenue South, Kingsthorpe, on a number of occasions during that time following the break up of their relationship, as well as her friend’s house on Cambria Crescent, Abington. 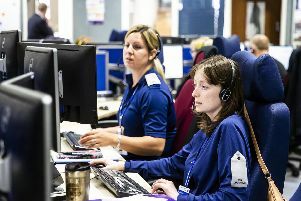 The offences involved him shouting through the letterboxes at both houses, looking in through windows and making what the court indictment described as continual “abusive and insulting telephone calls and text messages” to his ex-partner’s phone. On one occasion he shouted into the victim’s letterbox to ask “who she was sleeping with”. Prosecuting, Kwok Wan, said that, while Brock never engaged in physical violence, “there was a number of visitations, text messages and incidents of shouting,” during that period. The incidents were rolled into a single charge of stalking without fear, alarm or distress under the Harrasment Act 1997, which Brock pleaded guilty to a the court hearing yesterday. Magistrates deferred sentencing until June 10 so he could be assessed by probation officers. Defending him, Claire Fitzpatrick said that Brock had ‘struggled’ following the break-up of the relationship with his with the victim, the mother of his children. “He was concerned that over a period of time that she would enter a into a new relationship,” Mrs Fitzpatrick added. Brock also suffered from Asperger’s syndrome and had behavioural difficulties, the court heard, but stated that he never ‘threatened violence’ to his ex-partner. She added that he was ‘incredibly sorry’ for what he had done, and he had a supportive family. Magistrates granted Brock bail until June 10, providing he wears an electronic tag, sticks to a nightly curfew, does not contact either his ex-partner or her friend and does not enter either Eastern Avenue South or Cambria Crescent.